For the past few years I’ve been playing around with a couple sourdough starters I created, and I’m amused to note that, except on a very few occasions, I’ve ended up using starters instead of packaged yeast for my yeast-based baking needs. It’s really nice to be able to produce one’s own bread. It’s especially nice to be able to create a crusty, fluffy bread that approaches what one could get at the farmers’ market or restaurant. True, it won’t be the same as the awesome sourdough from Pescadero’s Arcangeli Grocery Co., but they’ve had years to develop their bread! I’ve been intimidated at the supposed labor and tricky technique involved with making crusty bread. But Jenifer’s recipe makes the process approachable, as it involves a heavy cast iron pot and lots of patient (but easy!) oven preheating. Don’t need a special oven or well-timed water spritzing, either. I call this recipe “Miranda’s bread,” named after Morrisa and nj’s daughter who enjoyed some I recently baked. That loaf didn’t contain buckwheat flour, so I’ve denoted it as optional. The key ingredient for this bread is stone ground, California grown Sonoran whole wheat distributed by Sustainable Grains. It’s one of the flour strains used in the original California sourdough breads from the 1800s. 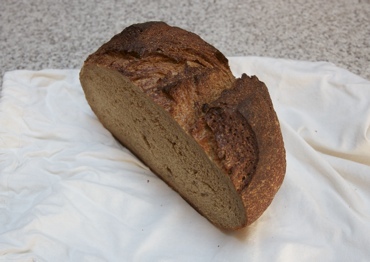 They offer that flour, amongst other grains farmed in California, at various Bay Area farmers’ markets. Note #1: Because this uses a starter instead of dried packaged yeast, this recipe takes a couple days to complete. If you can take the time, it is oh so worth it. Note #2: If you have a non-sourdough starter, this recipe still works! This yields a 2 1/2ish pound loaf. To save for later, wait until the bread is completely cool, slice if desired, then either (1) wrap in foil, pop into a zippy bag and store in the freezer, or (2) place in cloth or paper bag, pop into a zippy bag and store in the fridge. In a large mixing bowl, stir together the starter, Sonoran wheat flour, rye and barley flours, buckwheat flour (if using), and the gluten powder. Add to the water the molasses, salt and sugar, and stir until dissolved. Stir this into the flour mixture. Cover and let sit for about an hour, so that the whole grains can absorb some of the water. Stir in the olive oil, and plop in the bread flour. Using a stand mixer with the dough hook attachment, stir until combined, then knead on low speed for about 5 minutes. You’ll want a moist enough dough that will not stick to the sides of the bowl while kneading. Oil another bowl, and place the dough in it. Cover and allow to rise until doubled in volume — at least 8 to 12 hours, such as overnight. Place a 5 to 6 quart Dutch oven, or covered cast iron pot of similar size in the oven. Preheat oven to 450ºF degrees; I use the “convection baking” setting. In the meantime, punch down the dough and shape it into a nice loaf ball. Get a length of parchment paper, and line the bowl with it. This will act as a sling for the dough when it bakes. Plop the dough back in the bowl, and cover. Again, let it rise until doubled; this time it should take about 2 to 4 hours, depending on how warm your kitchen is. After the oven has reached 450ºF, keep the pot in there covered and empty for at least another 30 minutes, since you want it as hot as possible for the dough. After the dough has finished its second and final rise, slash its top a few times with a sharp knife. Carry the dough in its sling and place them both in the pot. Cover, lower the temperature to 400ºF degrees, and bake for about 25 minutes. Remove the Dutch oven’s top, rotate the pot about 180º degrees, and bake for another 20 to 25 minutes. Remove pot from oven, then remove the loaf using its handy sling. The bread is done if its internal temperature is around 200º to 210ºF. Cool at least a couple hours before serving. I actually prefer the bread the following day, as its texture is more even after a time. This was written by sairuh. Posted on Saturday, December 17, 2011, at 1:37 pm. Filed under Food. Tagged bread, recipe. Bookmark the permalink. Follow comments here with the RSS feed. Post a comment or leave a trackback. Sooooo so good! We loved ever last scrap you left with us after our Thanksgiving massacree!